What is the general island condition? The island is rebuilding very fast. We already have our lush green hills and blue oceans back. Most debris has been cleared but you will still see the destruction of Irma. The buildings are currently in repair mode and not all facilities are available yet. All important products and services are available but you will only find a limited number of clothing and jewelry shops. Can we book accommodation already? Yes some hotels are already taking new reservations. The choice is limited at the moment but the hotels and resorts are working around the clock to open as soon possible. Find your available options here. Is there enough food available on the island? Yes the majority of supermarkets have reopened already and are fully stocked. You will be able to find all the groceries you need. Are the roads accessible? Can we rent cars? Yes all the roads are cleared from debris and fully accessible. Car rentals are available as well. Are the restaurants open already? Yes there are many restaurants open already and this number is increasing every week. Are the beaches clean and safe to swim? Yes the beaches have been cleared from debris and are back to their old picture perfect condition. Is there a deposit required to book? Yes to confirm your booking, we ask for a 20% deposit. We accept cash payment in USD Dollars and all major credit cards such as MasterCard, Visa and American Express. Please note that a 3.5% surcharge applies to all card payments. We provide a full refund if cancellations are made a month before start date or when a cancellation is made by the company due to bad weather conditions or technical problems. We provide a 50% refund if cancelled >10 days before charter date and no refund if the charter is cancelled <10 days before charter date. Please be aware that we charge the full charter amount if cancellation is made within 24 hours before your departure. Gratuity is greatly appreciated and at your own preference. A customary tip is about 10-20% of the charter rate. We are located in the Dutch side marina of Oyster Pond. Please find our address and location map on our contact page. Our catamarans offer great stability and most of our stops are based in sheltered areas. For people who easily get seasick, we recommend to have a heavy breakfast and to take seasickness pills as a preventive measure. Our captain (and crew) will ensure your comfort and will provide you with advice on how to treat seasickness. From what itineraries can we choose from? We offer three itinerary options: St Maarten, St Barth and Anguilla. Please find more detailed tour information on our itinerary page. Please note that these are suggested itineraries and can be changed upon your wishes. What is your most popular itinerary? Our most popular itinerary is the local Sint Maarten itinerary. This itinerary offers the best snorkeling opportunities and provides a good mix between different stops. What itinerary is best suited for families? The most family friendly itinerary is the Sint Maarten itinerary. This itinerary offers the most sheltered areas and will provide you with the most comfortable sail. It requires the least sailing time and is most loved by children. How long is the sailing distance to St Barth and Anguilla? St Barth: The sail will take about two hours with our sailing catamaran and a little under one hour with our power catamaran. 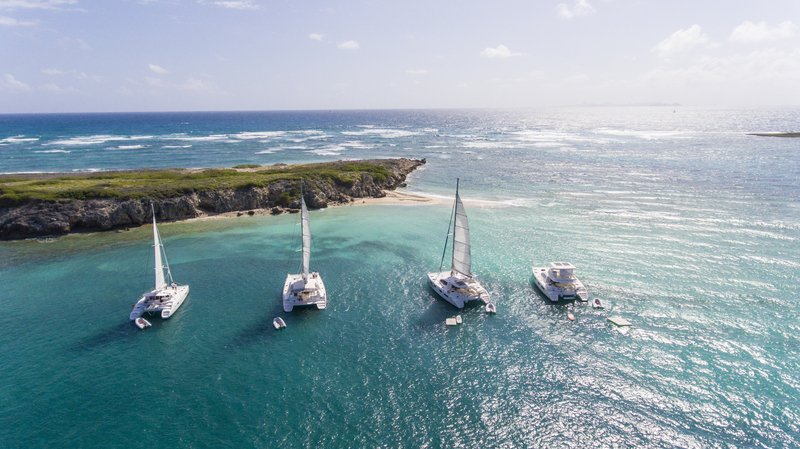 Anguilla: It takes 1 hour and 45 minutes to sail to Anguilla and 45 minutes with our power catamaran. What is included in the day charter rate? The charter rate includes: Captain + Drinks & Snacks + Snorkeling Gear +Diesel and After Charter Cleaning. The charter rate does not include: Lunch +Towels + Marine Park & Custom Fees and Gratuity. The drinks we serve on-board: Water, Sodas (Coke, Diet Coke, Sprite, Ginger Ale, Club Soda), Fruit Juices, 1 Bottle of Rum, 1 Bottle of Vodka and 24 Heineken beers. The snacks we serve on-board: Chips, Pringles, Cashews and Mixed Nuts. What is included in the term charter rate? Term Charters Include: Captain + Bed Sheets & Towels + Snorkeling Gear + After Charter Cleaning. Term Charters Do Not Include: Food Provisioning + Diesel + Water + Marine Park & Custom Fees + Gratuity. Do you also have water toys available? Yes, you can choose to add a kayak, paddleboard or fishing gear on-board. Each item can be added to your charter for a daily rental rate of $20 per item. Can I make use of the 15% couple discount? If there are only two people in your group, we will be able to offer you a 15% discount on the charter rate. Or if it’s two adults with a child under the age of 5. When do your low season rates apply? Between May and October we apply our low season rates. You can choose three different options for lunch. 1. We can arrange an on-board lunch at $25 per person. 2. You can have a restaurant lunch at a restaurant of your choice. 3. You can bring your own lunch on-board. What does the on-board lunch menu include? The on-board lunch is a French gourmet style lunch prepared by Stardocks, a restaurant located at our dock. The lunch includes a fresh mixed salad, baguettes, delicatessen meat, cheese platter, quiche and a fresh fruit salad or apple tart. Are you able to cater special request such as vegetarian, gluten free, etc.? Yes, we can cater special requests as long as we are notified 48 hours in advance. What should we bring on our day charter? Please bring anything you would bring on a regular beach day such as towels, sunscreen, hat and some money if you plan to have lunch at a restaurant. You can also bring a camera or action camera to capture the best moments of the day! Please do not forget to bring your passport if you go to St Barth or Anguilla! What should we bring on our term charter? Our best advice is to pack light! Please pack your items in a bag (sport bag for example) as we do not have space for multiple roll on suitcases. Please make sure to have your swimwear, toiletries, underwear, sun protection and we recommend to take a warmer (wind) jacket for in the evenings. Are we allowed to bring our own drinks & snacks on-board? Yes feel free to bring your favorite drinks and snacks with you! You can store it in the cooler or refridgerator on the boat. We ask you to take liquor in moderation to ensure your safety on-board. What footwear is allowed on the boat? We do not allow any footwear on the boat but we kindly ask you to go barefeet. We will store your footwear in a basket and will have it ready for you at the various stops.